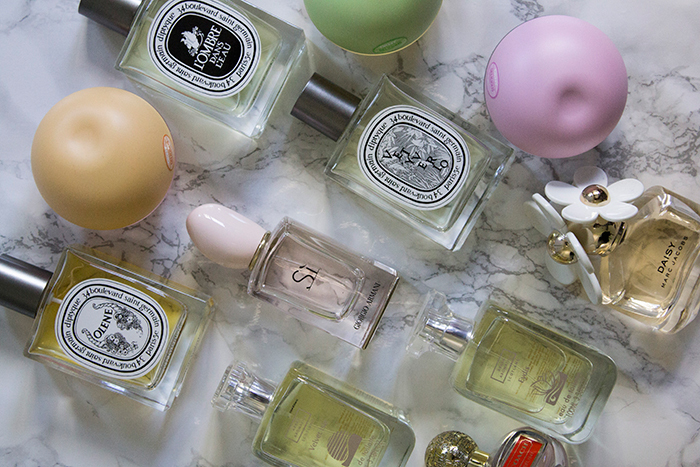 Over this year I've tried lots of new and exciting scents but I still have a soft spot for some old favourites. Fragrance is such a personal thing and it does take time to find your perfect scent so I thought I'd share the fragrances I currently own and adore. My scent preferences tend to go towards fresh Spring florals and this features in the majority of the fragrances featured today. I've been a big fan of Diptyque fragrances for quite some time and currently own three of their scents. First is Diptyque's Olene which is the perfect scent if you're a fan of Jasmine. For an eau de toilette it actually appears quite strong so a little spray is all you need. If you tend to go towards rose/garden scents then Diptyque's L'Ombre Dans L'eau is for you. It's a little more mature than the other scents I own so it's not my favourite but I do wear it occasionally. My go to indecisive perfume has to be Diptyque's Vetyverio as it's perfect for every occasion. It's very woody and inoffensive, your perfect interview fragrance. Moving onto something a little more fun is the DKNY Delicious Delights* collection which I recently spoke about on the blog. These scents are inspired by the Summer so they're perfect for this time of the year. DKNY Fruity Rooty is as you can imagine the fruitiest fragrance from the collection with notes of blackberry and blueberry. If berry scents aren't your thing, DKNY Dreamsicle is much more of a peachy/apricot scent, almost like a Summery cocktail. For something a little more toned down, DKNY Cool Swirl is more laid back with a tropical twist. If I feel like wearing something a little more natural, Arran Aromatics* always deliver. Arran Aromatics Velvet Isle is a great Summer scent with hints of coconut and earthy notes. It's a little more laid back than your average Summer scent so it's really easy to wear for a variety of occasions. For something a little different, Arran Aromatics Eydis definitely ticks the boxes. It's a citrus & bergamot based fragrance which is normally something I avoid but it's definitely a lot more subtle than your average citrus scent. It features gorse (a favourite of Arran Aromatics as I've been told! ), honeysuckle and violet which adds an element of sweetness to it. One that I've loved for a while but sadly is now being discontinued is Coach Poppy. I'd say it's the perfect Spring floral fragrance as it's very light but also has a hint of freshness to it, with notes of cucumber, gardenia, pink water lily etc. I'm very sad it's no longer available and I'll be clinging onto the very last drop! If there's one fragrance that everyone has in their collection it's Marc Jacobs Daisy. The majority of you have probably smelled this scent or even owned it before but it has a real, white floral, woody fragrance which is usually my go to when it comes to perfume. If I'm honest this is probably my least used fragrance as it is so popular, it doesn't really feel unique to me but I do like to pop it on every now and then. Last but not least, a fragrance I've been enjoying a lot this year is the Giorgio Armani Si* perfume. Scents with fruit in them aren't usually my go to, but I love the combination of florals and fruity notes in this fragrance. Blackcurrant and rose mix together so well, with a hint of vanilla and musk. If you've ever tried Lush's Ro's Argan Body Conditioner, it's basically that in perfume form. The rose isn't your traditional granny rose scent and it's sweet without being sickly. If you've made it this far, well done! I would like to point out that no one really needs this many fragrances at once. As a blogger, I've been very lucky this year that I had the opportunity to try new fragrances which explains why there are so many. Out of all the fragrances mentioned, if I had to choose one it would have to be Giorgio Armani Si as it's so unique and really makes you stand out. I hope you've enjoyed my fragrance collection, I'd love to hear what everyones wearing at the moment!